When some new guitarists break their first string they stash it in the closet and forget about it. Me, I put the sweaty axe back in its case and asked my parents to take me to the local music store. After a morning full of senseless racket emanating from my bedroom, my mom welcomed the drive. A new guitarist probably has not yet noticed the difference in sound quality between a new string and the old gritty ones still gasping on to the tuning pegs. As an experienced guitarist, I cannot bear to have a mixture of old and new on my guitar, but I remember the first couple of years where I would go to the music store and buy one new "e" string for $1. When I got home after my big purchase I would string it up and then five minutes would pass by and the "b" string would pop off. I learned the hard way that when one string breaks (unless you just put it on), they all are about to go. Which is just as well because a complete set of fresh strings will bring back a nice tone to your guitar. First, lay your guitar on a surface, like a bed, your lap or a table. You can use a cloth or towel to put under the guitar, so that it does not get scratched. If the headstock of your guitar is built at an angle, make sure that it is not resting on the surface with the body of the guitar. Now, start unwinding the sixth string using its tuning peg. Notice when the string becomes loose enough to remove it from the peg and carefully pull it out. Do not remove all of the strings at once. 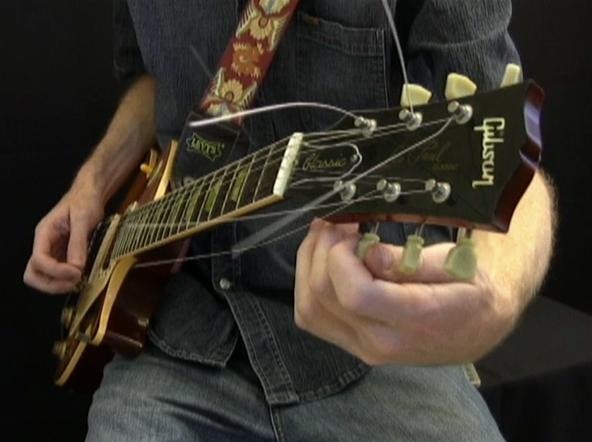 Doing this releases a lot of tension on the neck of the guitar and can cause serious damage. Next, simply remove the string from the bridge. Open and unwind the new sixth string. Thread the string through the hole in the bridge. Pull it until the ball connects firmly with the bridge. Now, thread the string through the inside of the tuning peg. Leave enough slack so that you can wind it a few times around the peg. Check to make sure that the string rests in place on its saddle and on the nut. Holding the string in place with one hand, its time to wind the string with the other. Using your fingers or a string winder, turn the tuning peg counter-clockwise. Turn the string until it becomes tense enough that you no longer need to hold it in place. Now, repeat these steps on the rest of the strings. After you have finished changing all six strings, tune the guitar. Gently stretch the strings by pulling up on each one individually and then tune it again. Now cut off the excess string and enjoy. I find this doing a great disservice to any "first timers" around. First, the pic shows dangling excess strings, after strung up. A big no-no, just as well as coiling the strings up. It would be better to publish a pic after the excess strings were cut off. The warning of not to take off all the strings at once. Totally bogus and BS! You may very well do this on any guitar actually. How on earth do you think there could be made any maintenance on the frets or frets polishing if that wasn't possible? On other places, where they tell you "how to" about guitar storage for a long time in it's case they actually advocate for loosening the strings so much they don't produce tension on the neck at all, i e the very much same slack as removing all strings. Mind you, without adjusting truss rod accordingly. Some guitars have no adjustable truss rod anyway. This may be overkill know-how for any beginner or first timer, but I say, do as you please, you can, and should, take off all strings at once without EVER risking damaging you guitar anyway, or neck. For how long time or as short time as you like. Granted, there's no damage done when removing/changing one string at a time though, but the reasons given here is totally BS and bogus, about tension on the neck. It'll just scare off beginners in a very unnecessary way.